In the library, these are the days when we get frantic parents looking for a Halloween book to read at their child's school and finding that all the books are gone. This may be you. 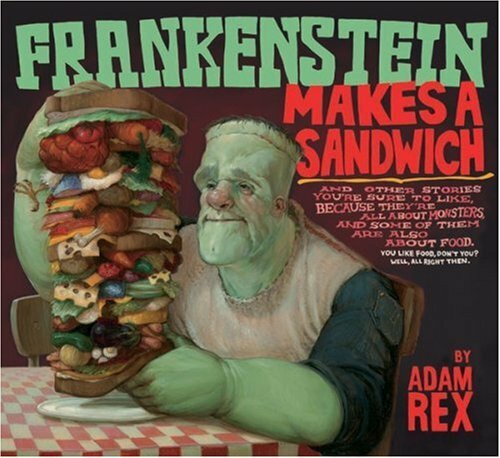 But no fear, there are some great monster books around that will fill the Halloween gap and that are often overlooked by parents heading only to the shelf with the big pumpkin sign. 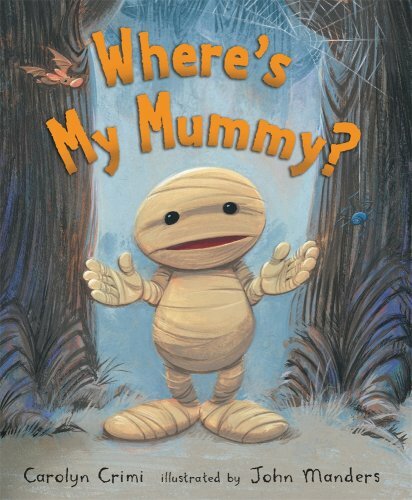 When Baby Mummy heads outside for a late-night game of "Hide and Shriek," he ends up searching for Mama Mummy in the deep, dark woods. Different monsters advise the little wrapped guy to go to home, but he trudges on unafraid, until a tiny creature gives him a big scare. But Mummy - or mommy - is there to give him comfort and take him to bed. The wonderful illustrations have just the right comical touch to take the edge off the spooky subject, and the story adds just enough suspense to the fun. Great for preschoolers. 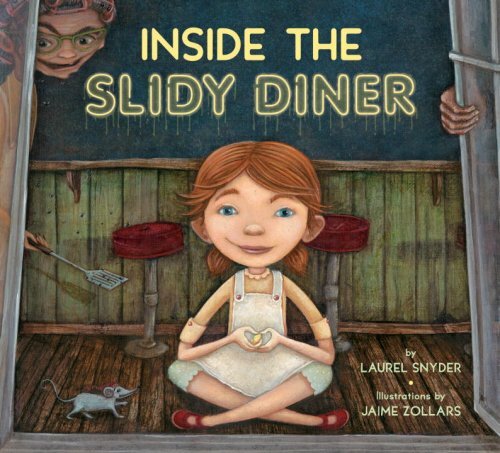 Edie is trapped inside the Slidy Diner for stealing a lemon drop, and gives a youngster a tour of the scary restaurant where patrons eat pig's heads and pies are garnished with eyeballs. This is definitely a book for the gross-out crowd, who will delight in the bug-filled flooded restrooms, the wall-mounted huge cockroach, and the most-questionable "chocolate milk." Detailed illustration supports the story with odd-looking patrons and clever visual jokes. Gruesome, creepy, and loads of fun for the school-age set. For some reason, people insist on giving these books to their preschoolers and then denouncing them because their precious tots aren't interested in these poems about various monsters. The smaller ones somehow fail to grasp the cultural and literary references or get the jokes. They aren't wooed by the detailed and varied artistic styles. So clearly, these parents claim, these books are not all that. HAH! And I say again, HAH! While shaking my head, of course, and noting that just because a book has pictures, it does not make it a "picture book." Sure, read it to your preschoolers if you feel the need, but it's the bigger kids who are going to appreciate the brilliance, the humor, the artistry of these amazing books. These are the perfect books to share in higher grades when the kids are wanting stories - especially to mark special times like Halloween - but parents don't think about sharing books in the classroom. I read the first one to my daughter's fifth grade class and they loved it. It was apparently very popular for the week I left it there, and I heard groans when I picked it up. Don't miss these fabulous poetry books, but do think about the right age of the reader. By the way, adults fall into that "right age" group. We just got a new monster book at my library: THERE WAS AN OLD MONSTER by Rebecca Emberly and Adrian Emberly. Can be sung (always a plus) and is slightly gross (also a plus!). And I'd also recommend TEN LITTLE MUMMIES by Philip Yates. I can certainly sympathize with people looking for Halloween books when there are none to be found on the shelves...! I love to give the Frankenstein books to kids (mostly boys) looking for poetry because they got that dreaded poetry assignment aaaaaargh. One of my favorite Halloween read-alouds is Algernon Graeves is Scary Enough by Peter Bollinger. A lot of different monsters represented but not at all scary, and it's about the pain of finding a decently scary halloween costume.